In the early days of courtship, this was the food of the gods. 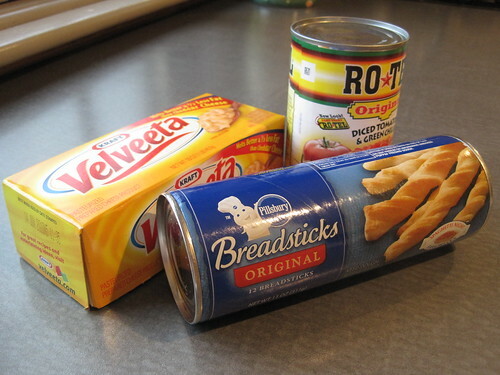 Breadsticks and Rotel dip. A few years later, we could not fathom such a lavish meal of "cheese," fat and starch without a fiberous antidote. For tonight's special movie night, we will introduce Frankie to this wonderful food with an accompaniment of lightly salted and blanched fresh veggies. It will be nostaligic and a wee bit healthier. Our drink? Clos Normand French fermented cider. Should be interesting. I am a big fan of Ro-tel. I use it in my second place Clintonville Chili Bowl Chili.